Made in England, c 1862. This gig was probably built in England as early as 1820 and is one of the oldest and most original horsedrawn carriages in Australia. It carried mail between Sydney, Windsor, Parramatta and Dural (originally known as Dooral). Stanhope gig designed for the carriage of two persons. The two passenger seat is framed by an iron rail with a cushion covered in leatherette (imitation leather) and padded with horsehair. The body on which the seat is mounted serves the purpose of a locker for luggage. In turn the body is mounted on two pairs of semi elliptical springs. Two slightly upwardly curving shafts extend from the front of the vehicle. The 14-spoke wheels feature traditional felloe construction of the rims and wooden hubs into which are set the spokes in staggered formation. A mail patent axle is indicated by three bolt heads set at 120° on the face of each hub. The initials 'TM' appear on each hub and on the upper side of the right hand axle is 'H.SMITH / Y / LONDON'. Probably made in England by an unknown coach maker, c 1862. The term "gig" refers to a wide range of two-wheeled vehicles that carried only two people and were drawn by a single horse harnessed between two shafts. Their design evolved from another earlier generic form of vehicle, the chaise, which in 18th and 19th century England described all two-wheeled vehicles pulled by one horse. In his Treatise on Carriages (1796) William Felton used the companion term "curricle" to describe all two-wheeled carriages drawn by two horses, harnessed on either side of a central pole. The curricle was probably of Italian origin and was also derived from the chaise but was of more elegant and heavier construction. The gig originated in about 1790 and the first recorded use of the term "gig" was by Felton's Treatise on Carriages in which he describes gigs as "one horse chaises?that hang by braces from the springs". This means that the rear of the body of the first gigs was suspended by leather straps (braces) from whip springs. The first Stanhope gig was built in 1815 by the London coach builder John Tilbury for the Hon. Fitzroy Stanhope, a noted English sportsman and brother of the Earl of Harrington. Its design became the most popular in England and Australia. Inexpensive and reasonably comfortable, gigs were also easy to handle and therefore suited to poor colonial roads. The first design for the Stanhope gig featured a spindle-backed seat mounted on an angular boot which carried luggage, a design known as the Tilbury seat because it was common to several vehicles built by Tilbury. The invention of semi-elliptical springs by Obadiah Elliot in London in 1804 revolutionised carriage design. The new curved multi-layered springs were mounted between the axle and the body of a carriage and offered great improvements in the comfort of travel. From its first appearance, the Stanhope gig featured semi-elliptical (also known simply as elliptical) springs. 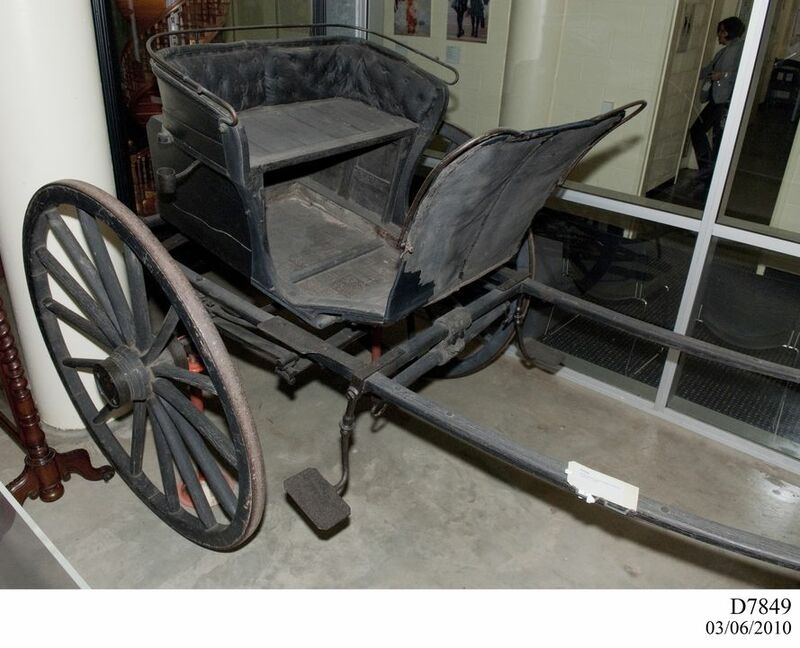 Two-wheeled carriages imported from England were commonly used in Sydney in the early decades of the 19th century. Most of them were gigs of various designs, while other types included dog carts (a later derivation of the gig designed to carry sporting dogs under the seat), buggies (a hooded form of the gig), curricles and chaises. There were very few vehicles manufactured in the colony at this time and imported vehicles were prized for their up-to-date styles, quality and associations with the "Mother country". Advertisements in the Sydney Gazette in about 1810 commonly refer to two wheeled vehicles including gigs, chaises and buggies. Peter Cunningham, the Surgeon-Superintendent of New South Wales, observed of Sydney in 1827 that "?few individuals of any respectability are without their gigs or riding horses?" This gig was probably built in England as early as 1820 and is one of the oldest and most original horse drawn carriages in Australia. It carried mail between Sydney, Windsor, Parramatta and Dural (originally known as Dooral).